Yes, Superman in his black suit was filmed for Justice League. The question has finally been answered, but we're probably never going to see the footage. Justice League was released last month to mixed response from critics and fans, but a lot of that has to do with the clashing visions between Zack Snyder and Joss Whedon, who was brought in to do rewrites, reshoots and see the movie through the editing process. That meant a lot of Snyder's vision wound up on the cutting room floor. Including Superman's black suit. Fabian Wagner, who was the cinematographer on Justice League, recently revealed that, indeed, they filmed scenes with Henry Cavill in the black Superman suit from the comics. There are many things that didn't make the final cut of Justice League, but this is one that fans were really looking forward to so, knowing that the footage is out there somewhere is probably a big bummer. Here's what Wagner had to say about it. "There were [scenes shot]. It's a cool looking costume. Sadly we didn't see that either in the final cut. Zack takes his time with telling the stories and I've always liked that about his movies. There are a few scenes that I was very much looking forward to seeing which unfortunately got cut." It's worth noting that a visual effects artist who worked on Justice League recently said that the black suit was never part of the movie, but Fabian Wagner seems like he'd definitely know. So it sounds like we can put a nail in this coffin. The black suit was teased for Justice League last year when Henry Cavill posted an image of what appeared to be the famous black suit from the comics on Instagram. It seemed all but certain that we'd see the suit just weeks ahead of the release, as Justice League merchandise being released heavily alluded to it. Now we know why. The black Superman suit came to being in the The Death and Return of Superman comic book storyline. It's one of the most famous comic book stories in the history of DC, which is saying something. Zack Snyder partially, and very loosely, adapted elements of this storyline in Batman V Superman: Dawn of Justice. In the DC Comics storyline, upon his return following his death at the hands of Doomsday, Superman sports a black suit, which was a pretty big deal because people had only really seen him in his classic red and blue costume. 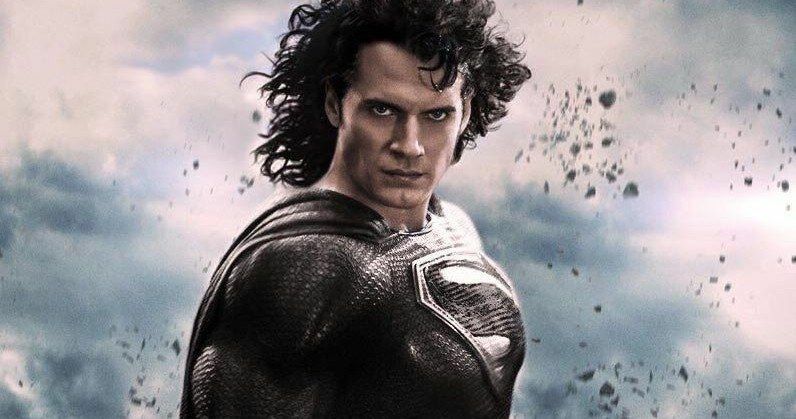 It's also well worth noting that Superman was featured with long, jet black hair, upon his return. Was that part of what was shot as well? We may never know. Fans have petitioned for Warner Bros. to release a Zack Snyder director's cut of Justice League, but it's not likely to happen. It would cost a lot of money to finish the cut and the studio is going to be lucky to break even on Justice League as is. So, even though this new interview with Inverse confirms footage of the black Superman suit exits, the odds of us ever seeing it are slim to none. Sorry, DC fans.